All audio connections are located on the bottom/rear of the via Fader chassis. For economy, the rear panel connector legend shows all four models with the connector legend for the Model VF10 shown at the very top. Connect the via Fader to virtually any line level source: balanced, unbalanced, transformer, or transformer-less. The VF10 line inputs and outputs are fully balanced and terminate on DB25 connectors that comply with the Tascam wiring standard. The via Fader has high headroom that will handle balanced signals up to +28dBu. As an added convenience, on the Model VF10 line inputs and outputs 9 and 10 may be accessed with the balanced TRS jacks instead of the DB25 connectors. 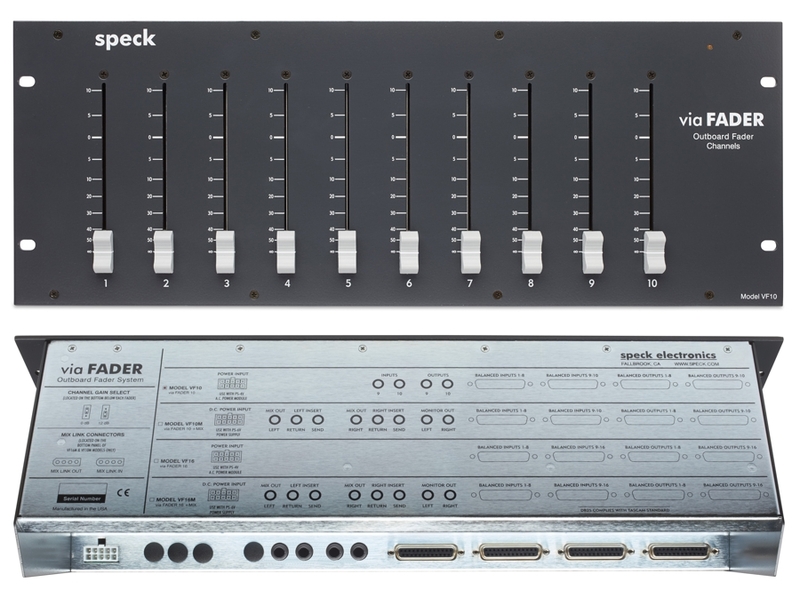 Included on the bottom panel (not shown on this image) are jumpers that allow you to add 10dB of additional gain to each fader channel.